This notebook stores all your notes in small sqlite database. It is allow you to sort, filter, create and delete it quickest way. Optional password protection. 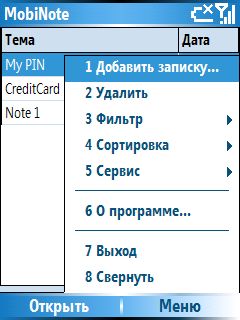 Rus/Eng interface. New features in v1.11 +Added password input prompt after longtime period (5 minutes) of inactivity. *Fixed some interface typos.